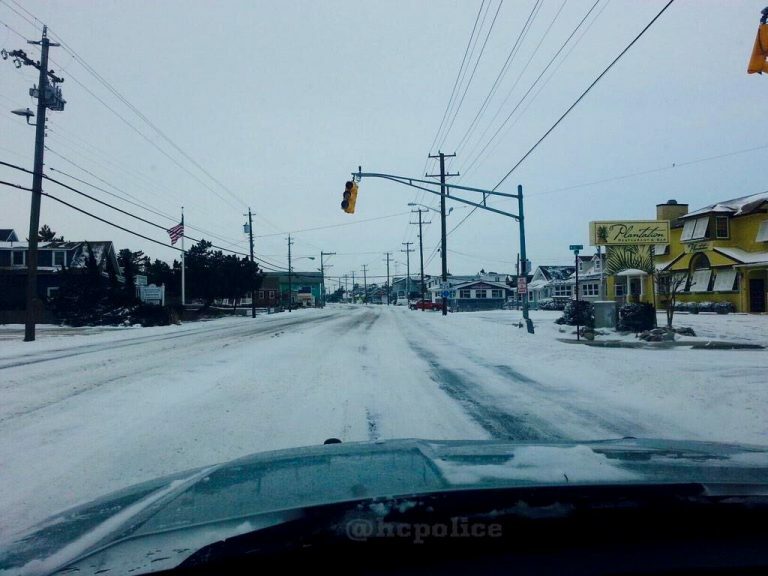 Long Beach Boulevard in Harvey Cedars Sunday morning by the Harvey Cedars Police Department. With many snow covered roads, blowing snow, and bitterly cold temperatures, driving at the Jersey Shore is a treacherous task this morning. Adding in the sub-zero wind chill values, if your car is outside, just walking is challenging. The takeaway from JSHN contributor reports is this: stay home if you can. Joyce LaBrutto: Whiteout still here in Jackson. Roads are not plowed. Slippery! Carol Stoffers: Nothing salted or plowed in Freehold, and they are very slippery. Deborah Welby: Hooper Ave (Brick/Toms River) a nightmare! Driving to work was insane. Tristin Fleck: Up to (Garden State Parkway Exit) 114 is bad. 116 plowed. Donald Stevens: Terrible in Point Beach. Just cancelled church services. Connie White: Route 70 in Lakewood looks bad. I’m not out but can see from my place. The people that are out are driving slow for Route 70. Jon Arch: Roads not plowed in Little Egg. Jim Matuszewski: I left work at 7 from Somerset and 287 South was good, but the Parkway was a sheet of ice from the Holmdel Barracks down. I got off at Exit 91. George Cox: Plows won’t help. I-195 keeps getting re-covered by the wind. Brandon McTigue: County roads in Manchester are terrible as usual. Bill Will: Plows just come through the main roads in my neighborhood in West Toms River. Still have light snow coming down, and of course, the wind. Stephen Smith: Route 35 south from Red Bank to Neptune was slippy with white-out conditions at intersections. Kathy Dalton: Drove from Marlboro to Holmdel to work this morning around 7:30. Routes 79 and 520 and Middletown Road were slippery and not cleared in most places.